Be the first to share your favorite memory, photo or story of Gailann. This memorial page is dedicated for family, friends and future generations to celebrate the life of their loved one. 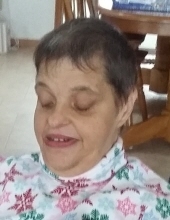 Gailann M. Molski, age 50, of Stevens Point, passed away on March 20, 2019 at UW Hospital in Madison, WI. Gailann was born on March 25, 1968 to Sylvester & Joann (Marquard) Molski in Stevens Point, WI. She attended local schools and enjoyed participating in special education classes. Gailann worked various jobs through Community Industries. Her favorite places to work included: folding laundry at Adventure 212 and delivering meals for Meals on Wheels. Creative Community Living Services was also a positive outlet for Gailann. She will be remembered as a social butterfly. Gailann relished visiting with friends, in addition to making new ones. In her earlier years, she enjoyed fishing and spending time at the family cottage in northern Wisconsin. In her spare time, she enjoyed coloring and putting together puzzles. She also loved spending time with her dog, Tippy. She is survived by her loving father, Sylvester of Stevens Point; brother, Rhody Molski of Stevens Point; and sister, Pam Sullivan of Plover. She was preceded in death by her mother, Joann Molski; and brother-in-law, William Sullivan. A Funeral Service will be held 3:00 p.m., Saturday, April 6, 2019 at Boston Funeral Home with Rev. Joshua Baumann presiding. A Time of Visitation and Sharing of Memories will also be held on Saturday from 1:00 p.m. until the time of service at the funeral home. To send flowers or a remembrance gift to the family of Gailann M. Molski, please visit our Tribute Store. "Email Address" would like to share the life celebration of Gailann M. Molski. Click on the "link" to go to share a favorite memory or leave a condolence message for the family.